The synergy forum between large corporations and small-and medium-sized enterprises (SMEs) was held at UNIST on Tuesday, July 4, 2017. The event was held on the topic of “Fourth Industrial Revolution and Cooperative Relationship between Large Corporations and SMEs”, inviting a number of local industry leaders to share their perspectives and experience that will help businesses thrive in the era of Fourth Industrial Revolution. The speakers at the forum were from nation’s leading corporations and organizations, discussing how to further strengthen the mutually beneficial cooperation between large firms and SMEs. The opening plenary lectures of the forum were given by Managing Director Jung-Hwa Lee of Large & Small Business Cooperation Foundation and Director Dae-Young Kim of Hyundai Heavy Industries, Critical Technology Institute, presenting on “Win-Win Strategy between Small and Large Enterprises” and “Fourth Industrial Revolution: Strategies for Marine and Shipbuilding Industry” respectively. The event also featured the following speakers for the invited keynote lectures: General Manager JeongKook Kong of SK Energy, Director ChanJu Deok of DUKSAN Hi-Metal Co. Ltd., and Professor Dong Sub Kim, Executive Director HyunSoon Cho of NEONENT Co. Ltd., and Director of Institute for Future Industry Strategy (IFIS) at UNIST. During the course of the event, General Manager Kong talked about SK Ulsan Complex, which plans on implementing smart factory environments to help boost manufacturing productivity. Under the smart factory project, the company has pushed to automate the manufacturing process, tapping into technologies, such as robotics. 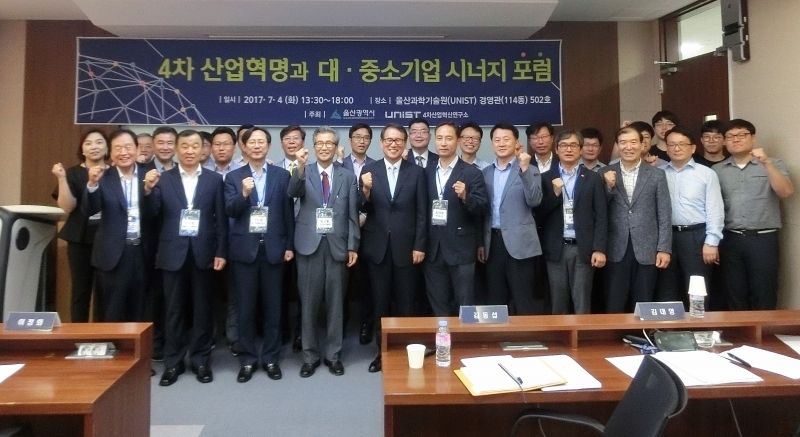 The city of Ulsan and UNIST are now preparing to hold the “Ulsan Forum on Fourth Industrial Revolution”, which is scheduled to be held from September 13-14, 2017. The forum will be attended by leaders and renowned experts from around the world, including the Founder and Executive Chairman Klaus Schwab of the World Economic Forum (WEF).